Education's Role in Business Future - WorldCity, Inc. 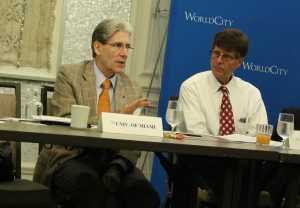 The CEO Club welcomed University of Miami President Julio Frenk, discussing four topics that can help education work with business in Miami, and therefore Latin America: career plasticity, accrediting competencies, tailored education for local businesses and targeting talent. What an opportunity it is for business to work more closely with higher learning, in particular in Miami, a city that serves as the headquarters for so many of Latin America and the hemisphere’s multinational companies. Here’s what the CEO Club discussed on how education and business can work together in the confines of today’s corporate structures to improve Miami and Latin America. The latest CEO Club. 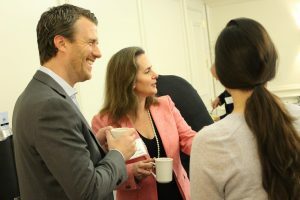 Click here for our Facebook album from the event. 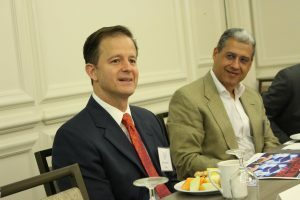 Examples of that at UM include executive education and the PETAL program – Platform for Excellence in Teaching and Learning, a platform that allows students to be present while still in the workforce, like UM’s Executive Master’s for Latin American professionals, taught in Spanish, that allows these executives to keep working and not take significant time off to attend classes. Education must adapt to the fast-paced nature of the digital age and allow management and executives to continue their education but complete it in a shorter period of time than universities have been used to. Traditional degree-earning structures will take too long to complete. Keough noted this idea makes so much sense because of the pace in which change is occurring. Flexibility in continuing education is needed more than ever. Frenk answered this question in four ways: earlier and expanded internships, deeper interaction with the business community to develop tailored programs, hiring graduates and moving away from federal money for research towards corporate sponsorship. The last notably would directly put resources towards solving issues and achieving goals needed both for the businesses and community. Frenk made the point that finding the right students and future employees must be merit-based, but in Miami that can’t just be about talent. It must also be about temperament. “You may be a genius, but if you’re a person who for whatever reason doesn’t believe in diversity, for example, you’re going to be uncomfortable (at UM),” said Frenk. Future WorldCity Events: Save the Date! Alberto Gavazzi of Diageo leads the discussion on disruption.